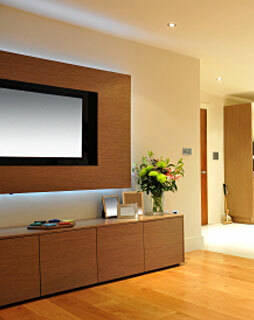 A Custom built media and entertainment center can bring life to any ordinary family room or living room. Our media storage can easily get rid of unsightly cords and will offer organization to the rest of your media collection. Never worry about losing the remote control again because our storage systems offer South Florida families the organization needed for a home media center. Premier Closets is able to transform a simple media center into a custom home media center of your dreams. Incorporate lighting options and sleek style designs so you have the best entertainment center in the neighborhood. It will give you the confidence to have family and friends over to your house for holidays and weekly sporting events without having to worry that your media center will be cluttered. You will make your friends jealous of your custom built wall units and TV furniture. Our design team works closely with you to understand exactly what it is you need and want out of your home entertainment center and we deliver more than most clients expect. Prepare to turn your old media center into a luxurious and inviting media center. Allow Premier Closets to give you to storage and design features you crave in a media center. Our upscale and sophisticated design ideas will give you a media center worth bragging about. We make storage and design flow together giving you exactly what you need out of a media center. Contact us today to speak with one of our experienced home media center consultants. Change the way you entertain forever with a custom built home entertainment center from Premier Closets.